ItemA-00140 - The wreck of the SS San Pedro on Brotchie Ledge; photo taken from Dallas Road at the foot of Menzies Street, Victoria; ledge about a half mile out. ItemB-00458 - Driard House, Victoria, formerly the St. George Hotel; forerunner of the Driard Hotel. ItemA-06194 - A little Indian girl with a load of firewood on her back; her dog accompanies her; Bella Bella. ItemA-03260 - The remains of Walter Anderson's Herald Street home, after the fire of 23 July 1907; Victoria. ItemA-06042 - "Daniel Wecahk of Hazelton with 162 beaver, 309 ermine, 72 marten, 55 mink , 14 fisher, 3 wolverine, 4 otter." ItemA-03490 - The last pack train out of Ashcroft. 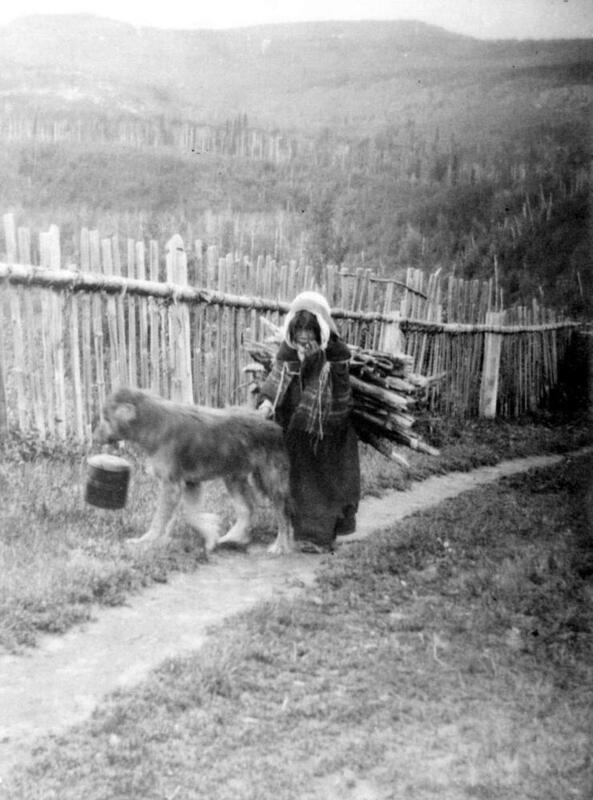 Item A-06194 - A little Indian girl with a load of firewood on her back; her dog accompanies her; Bella Bella.